Picking up after the events of Anne of Green Gables, Anne & Gilbert The Musical follows our beloved Anne Shirley as she starts her career as a school master and later as she goes off to University. Anne finds herself followed all the way by her childhood sweetheart Gilbert Blythe, who is quite determined to convince Anne to marry him, despite Anne’s hesitations. Covering the content of the second and third novel in Lucy Maud Montgomery’s series, Anne of Avonlea and Anne of the Island, Anne & Gilbert The Musical is definitely a family classic that will make the entire audience believe in love by the end. The Holiday shows at the National Arts Centre English Theatre are always some of my favourite shows. There’s so much hype and glitz and glam that go into the production that it’s hard not get excited. 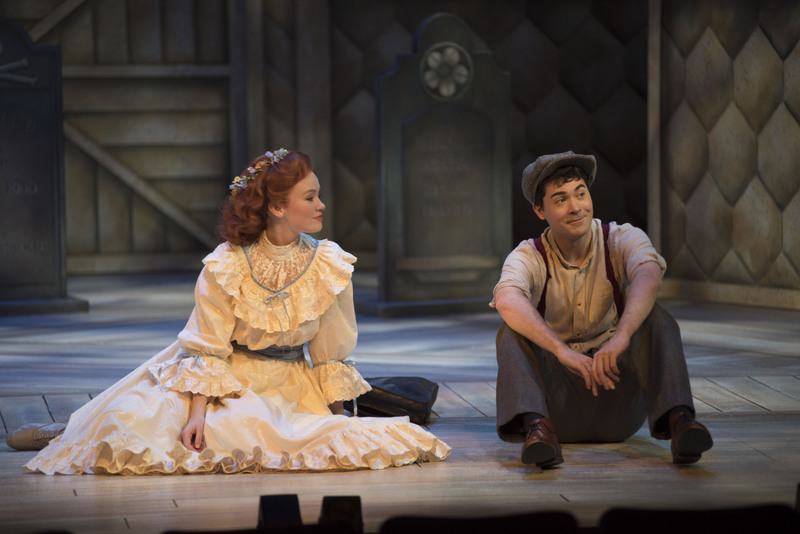 Anne & Gilbert The Musical features a very large and talented cast of young and old alike, and a modest 3-piece musical ensemble which is more than enough to get the right feeling for a Prince Edward Island themed musical. I always love the NAC stage designs. Sometimes they are elaborate, sometimes quite simple, yet Anne & Gilbert seems to fall somewhere in the middle. It’s a large set that could very easily be deconstructed and then reconstructed to change the scene without any lull in the show. The ensemble was fantastic, in fact, the most energetic and captivating songs included the entire cast on stage, singing, dancing, fiddling, or a bit of column a, b & c. There were two members of the ensemble cast who didn’t quite have the range for their characters, although, I believe that one of those two had a nasty cold, or at least sounded like they had a nasty cold, throughout the performance, and it doesn’t take away from the fun and talent that’s ongoing either. Anne Shirley, played by Ellen Denny, was perfectly cast. The energy and excitement that she brought to the character was quite palatable, and her energy was matched by her stage partner Alex Furber, playing Gilbert Blythe. Stealing the show anytime she was on stage though was Brieonna Locche who played Anne Shirley’s best friend, Diana Barry, whose over the top stage presence was just so adorably enjoyable I wish there had been more of her in the show! Anne & Gilbert The Musical is charming and fun from beginning to end, each and every song has it’s place and while some may have more of a quirk to them than the others, there’s truly not one piece that slows or bogs the performance down. The only criticism I would have is that while the songs and dances were beautifully choreographed and executed brilliantly in the space between numbers it sometimes felt like there was too much movement on stage for no reason, while it was a way to use up the entirety of the stage the unnecessary movement became quite distracting. There is nothing more Canadian than ringing in the Holidays with a piece of Canadian Theatre as well done as Anne & Gilbert The Musical. It’s a piece of theatre that you and your friends and family will be talking about all Holiday Season long. If you’re planning on being in Charlottetown, PEI on May 31, 2016 and through the summer make sure you don’t miss the 2016 Anne & Gilbert Prince Edward Island Production! Anne & Gilbert The Musical runs at The National Arts Centre English Theatre until December 23, 2015. You can purchase tickets here. But that’s just my opinion and I’d like to know what you think. Who was your favourite character in Anne & Gilbert? What was your favourite musical number? Join the discussion in the comments below.